As mentioned earlier, hashtags do not overrule privacy settings. What you see may be different than what I see. You’ll see all public conversations and those the author allows you to see. Understand that the typical user is seeing these for the first time. They aren’t Twitter pros. They are going to be confused. If every other word is a hashtag, it’s going to be annoying. Use one or two. Don’t write a paragraph of hashtags. It may increase reach, but it’s spammy and you won’t get the positive response you’re looking for. Have the reader in mind first and your business second. If you’re thinking about the reader, the hashtag will enhance your post. If you are thinking about your business first, it will be a distraction. Understand that if your post doesn’t add value, you are simply adding noise to that hashtag’s stream. And the hashtag itself adds noise to your post. While short is better, abbreviations could create issues as well. 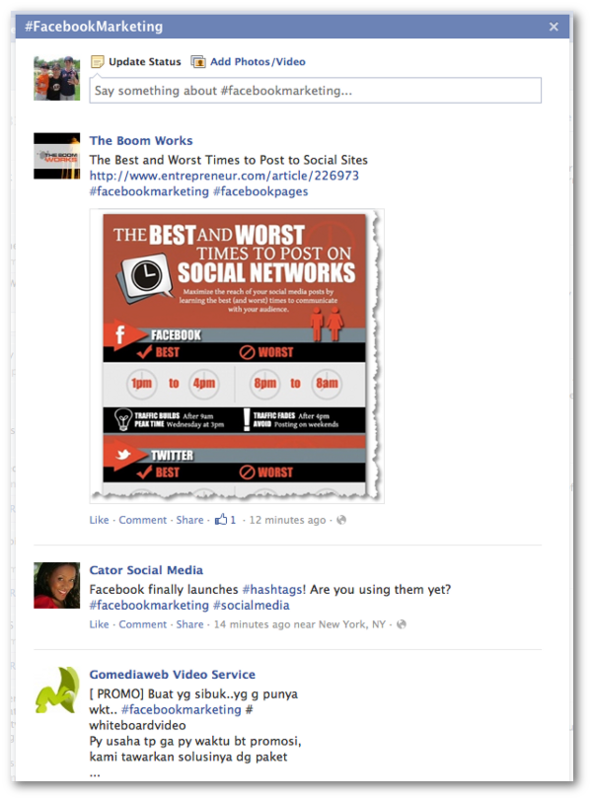 For example, posts will get split up between #fbmarketing and #facebookmarketing. Or #fbads and #facebookads. Use the hashtag that makes the most sense. If you want to create a conversation, keep it unique. If you want to join a conversation, use a popular one that is relevant. Don’t use spaces or special characters in your hashtag. The linkable portion will stop before that character. The only exception is the underscore (“_”). I fully expect most brands to latch onto the most popular hashtags. The goal will be Reach. They will be abused. And those streams will be spammed like crazy. Again, think about this from a user’s perspective. Why would you follow a popular hashtag filled with spam and irrelevant content? You wouldn’t. So feel free to create your own. Niche is okay. The purpose should either be to organize your own content under a hashtag or to reach a very specific group of users with your content. 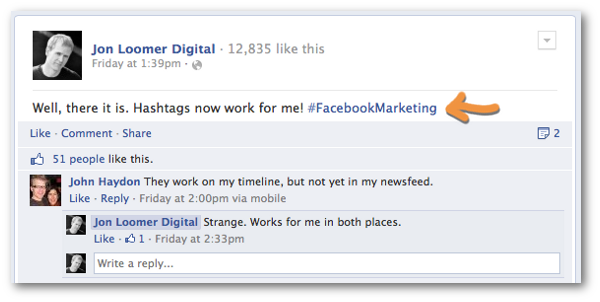 This is just a sampling of thoughts around how you could and shouldn’t use Facebook hashtags for your brand. How will you be using them?